To improve the ecological value of the lake, the Dutch society for preservation of nature monuments (Natuurmonumenten) proposed to create artificial island along the Houtrib Dam: Marker Wadden. In this plan, the thick, soft mud layer is used as building material for the islands thereby improving the ecological conditions in the lake by removing the soft mud layer at the lakes bed and by large scale wetland creation. The islands will consist of shell reefs, sandbars, swamps and reed beds which will be accompanied by a rich flora and fauna. For an impression, see the (Dutch) video below. The research described on this website will focus on the Marker Wadden and will have a physical, ecological and societal point of view. 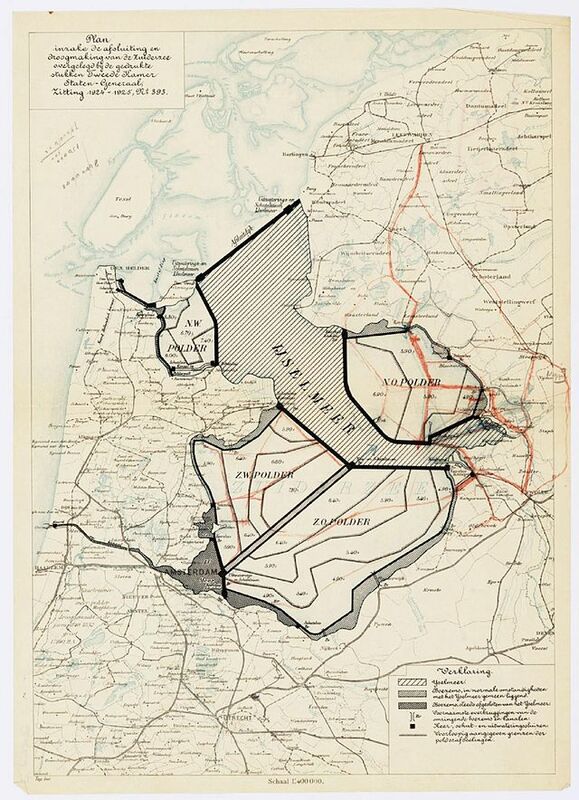 In 1891, Cornelis Lely designed a plan to close off the Zuiderzee (a marine bay in the Netherlands) from the Wadden Sea in order to create four separate polders (see Figure). The first phase, the closure of the Zuiderzee, was realized in 1932 by the construction of the Enclosure Dam (Dutch: Afsluitdijk). Nowadays, three polders have been realized. One polder belongs to the North-Holland province while the remaining two formed a new province, founded in 1986: Flevoland. The fourth polder has never been realized although the first preparations were already made: The Houtrib Dam was finalized in 1976 and separates the IJsselmeer from Markermeer. The original idea was to create the fourth polder from Markermeer. However, in 2006, the Dutch government decided to cancel plans of land reclamation in this lake. So, it was never the intention of Markermeer to exist! Nowadays, a thick, soft layer of silt/mud dominates the lakes bed. Markermeer is relatively shallow with an average depth of 3.6 meters. Already at low wind speeds, the wind-induced-waves causes erosion and resuspension of the soft mud layer. In turn, this results in a high concentration of suspended particles which inhibits light penetration in the water column. This soft mud layer originates from the underlying Zuiderzee deposit. This deposit is eroding at very high wind speeds and due to bioturbation. This eroded material cannot be transported away to the IJsselmeer because of the Houtrib Dam so eventually, the eroded material settles on top of the Zuiderzee deposit forming this soft mud layer. It is this soft mud layer that is the cause of the current deterioration of the ecosystem in the lake. Primary productivity in the lake is low as light penetration is reduced due to the suspended particles. Moreover, the soft mud layer also provide poor conditions for (aquatic) plants and other animals such as fish and benthic animals. You can say that Markermeer currently functions as a big aquatic desert. Current situation in the Netherlands with in deep green the three created polders.